I recently saw the Pioneer Woman make these on her Food Network show and thought, “I’ve got a lot of strawberry freezer jam, I should make these.” So I did and boy are they yummy! There was an upcoming appreciation event at school and I cut these into small bars and put them into bags for a snack at a later time. Just bite size pieces that were perfect for a quick treat or afternoon craving. When the Pioneer Woman made these the topping covered the jam. I may have used too much on the bottom but I didn’t think using half was enough for the bottom and didn’t want the jam to seep through and burn. By not covering the top completely with the oat mixture I think it makes for a pretty presentation. If you don’t have homemade strawberry jam, store-bought is fine. Use one you like. You could also mix it up and use raspberry or another flavor of your choice. Preheat the oven to 350 degrees F. Butter a 9 x 13 inch rectangular pan. Mix together the butter, flour, oats, brown sugar, baking powder and salt. Press half the oat mixture into the prepared pan. Spread with the strawberry preserves. Sprinkle remaining oat mixture over top and pat lightly. Bake until light brown, 30 to 40 minutes. Let cool completely and then cut into squares. 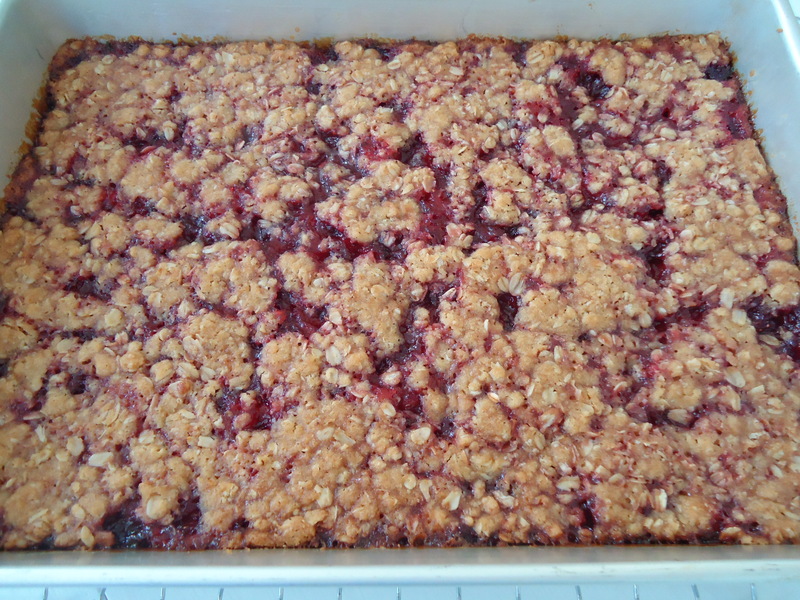 This entry was posted in Breakfast, Desserts and tagged jam bars, Oatmeal, pioneer woman, ree drummond, snack food, strawberry jam, strawberry oatmeal bars. Bookmark the permalink.